Now that fall is almost here, we find ourselves craving richer, warming drinks. After FoodBabe's viral dissection of perennial Starbucks favorite Pumpkin Spice Latte, we knew we'd be steering clear of that sugar bomb, full of highly processed ingredients -- and honestly pretty draining on our wallet as well. 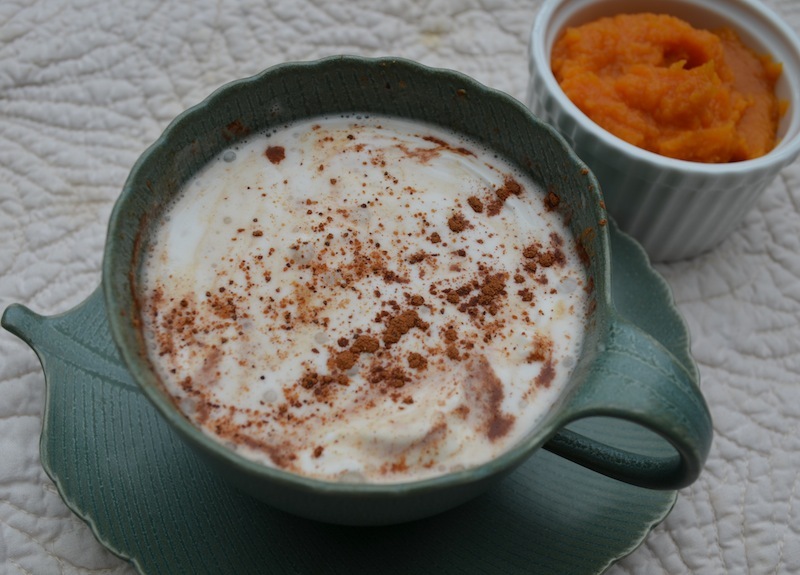 This pumpkin spice tea latte recipe is decadent and flavorful, but it is non-caffeinated, sweetened by a coconut sugar-based spiced syrup and a little maple syrup, and it's vegan too! Plus it actually contains real pumpkin (and all of its wonderful beta carotene)! 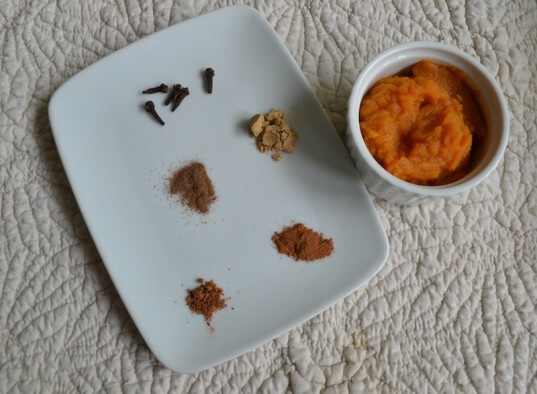 You can use any extra pumpkin to make some chocolate pumpkin pudding or pumpkin carob chip cookies. A note to the more conventional Pumpkin Spice Latte devotees: this recipe is not meant to mirror exactly the sugary sweet Starbucks favorite. Our hope is that this earthy, tea-based beverage will become your go-to morning drink, an afternoon tea treat, or even after-dinner liquid dessert. 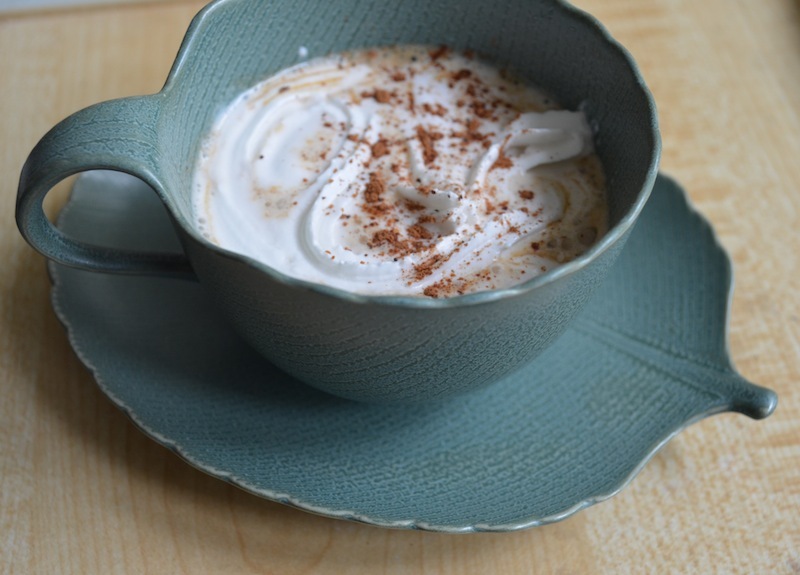 This comforting tea latte is even one your kids can sip on too! So bring on that chilly weather, the Friday night football games, and the apple picking excursions: we've got just the warm seasonal drink that can accompany you as you celebrate the season. 2. Make the spice syrup. In a small pot or pan, bring the the coconut sugar and 1/4 cup water and the spices to a boil. Let mixture bubble and boil for about 2 minutes, until the sugar has dissolved. You will be left with a thick, fragrant syrup. Pour into a small container and set aside. 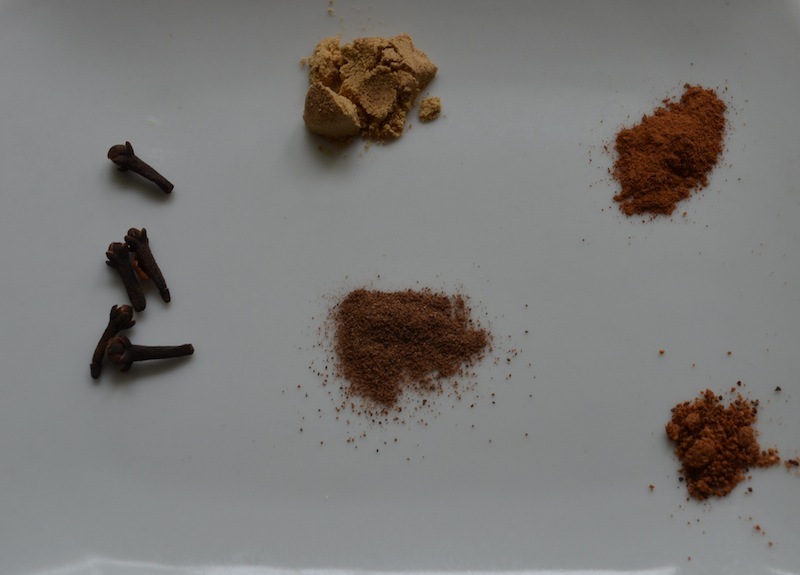 If you used whole cloves as I did, be sure to remove them from the syrup at this time. You can also use this syrup to add flavor to your coffee drinks as well. In a small pot (I used the same one I made the syrup in so that I would get any residual spices), heat the milk and remaining cup of water to a boil. 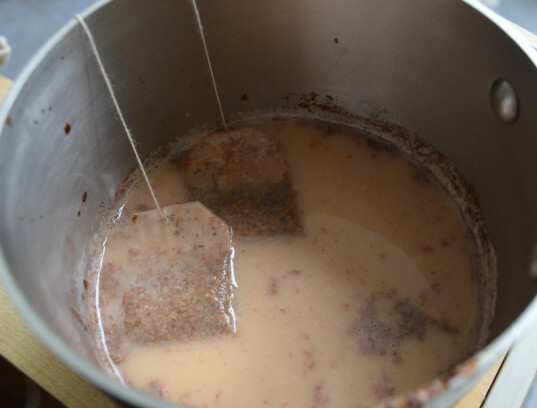 Once boiling, drop in two tea bags and turn off the heat. Cover the pot and let steep for 6 or 7 minutes. 4. Blend up the latte. 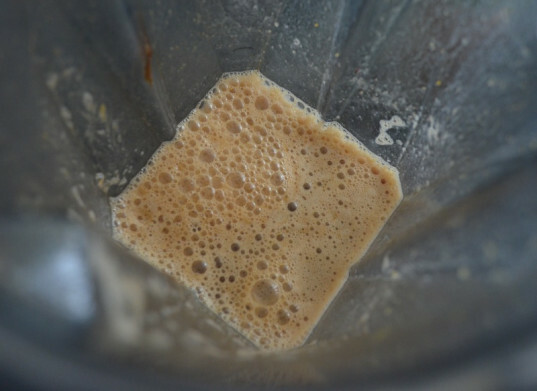 While the tea is steeping, add 2 Tbsp of the spice syrup and all of the pumpkin puree into the blender. Once the tea is done steeping add it to the blender as well and blend for about 10 seconds. The mixture should get frothy. Taste and add a teaspoon or two of maple syrup if desired for more sweetness. Pour into mugs or cups, top with whipped cream and cinnamon or nutmeg, and serve warm. Makes 2-4 servings. Happy fall!